The best way to describe Young Fathers latest album lies in this quote from an email between group member Alloysious and Young Fathers management concerning the album title, “We don’t make music to please other people or write certain lyrics to do so, either. Why start now?” This quote embodies the latest offering in the strange genre of trip-hop with the equally strange titled, White Men Are Black Men Too. While I don’t personally believe a bunch of White, Scottish men (with one African-American) are remotely of the African American heritage—as Young Fathers seemingly claims they are—I can see why they chose such a thought-provoking title. The music you hear in this record has African-American roots combining bluegrass, soul, jazz and hip hop in a way that comes off as a white, indie less electronic version of Death Grips. Nevertheless, the problem in White Men Are Black Men Too doesn’t lie in the sound or the message of the album, it simply lies in the execution. The album starts adequately with “Still Running,” which is a surrealist track that reminds me of an even more artsy F.U.N. It’s not a particularly good track, but adequate nonetheless. Then, we see things pick up. While the next five tracks off the album don’t always hit, when they do hit, it’s spectacular. From the groovy, bass-filled “Shame,” a track that even the biggest critics of this album can’t resist tapping their foot to. To the catchy hook of “27,” which may be the only saving grace of the song, but is good enough to carry the entire track. These tracks lead up to arguably the best track, “Rain or Shine,” which features an excellent synth coupled with up-tempo drums that bring a funky vibe to the track. The soul of the vocals as well as, the signature lack of restraint that gives Young Fathers their signature sound all culminate into the embodiment of what this album should be. Unfortunately, the inconsistency of Young Fathers’ musical ability rears its ugly head in the next track, “Sirens,” which features excellent vocals and a great build-up that disappoints with a lackluster hook that does Young Fathers no justice. The last track even remotely worth talking about is the next track, “Old Rock N Roll,” in which Young Fathers sounds the most hip hop in terms of the album. It features a wide range of instruments, vocals and music overall. Hell—it even features an African chant. This track also seems to be the one Young Fathers decides to make their statement, I’m tired of playing the good black/ I said I’m tired of playing the good black/ I’m tired of having to hold back/ I’m tired of wearing this hallmark for some evils that happened way back/I’m tired of blaming the white man/His indiscretion don’t betray him/A black man can play him/ Some white men are black men too/Niggah to them/A gentleman to you. What exactly their message is? I have no clue, but there’s obviously something they are trying to say in a very convoluted and complicated way. From this point on, Young Fathers drops the ball, the rest of the tracks are either boring, annoying, uninspired, or just sound too experimental lacking any sense of direction. In this last half of the album, there are times where Young Fathers sound like they just went to the recording studio, started playing and just fucked around in the studio. While this raw style can be endearing, it gets repetitive quick and begs for a song with some funk or a catchy hook like they showcased earlier in the album. 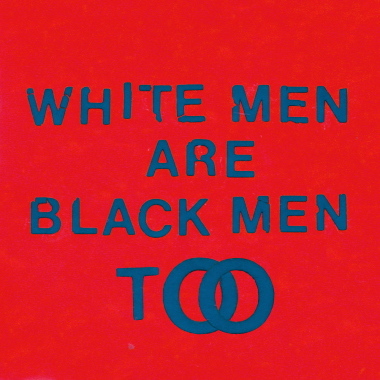 Overall, Young Fathers’ White Men Are Black Men Too ends on a sour note, which is a shame because the first part was solid. The album is a jumble of different sounds that work at times and at other times are just too much. Where Young Fathers shines is when they use these different musical jumbles, but add consistency in either the bass, hook or drums—something they fail to do in the back half of the album. In the end, as an overall album, Young Fathers accomplishes what they set out to do but forgets about the listener in the process.